Overall: Whether or not you have kids, plan to have kids, or even just plan to be around kids this is a book you definitely need to read. No matter what background you come from, we have all experienced anxiety in one point in our lives. Whether it comes from school, stressers at home, or maybe even just a subtle nagging in the back of our heads that keep us up at night, we are constantly experiencing anxiety. Some anxiety is good, it keeps us motivated and helps us in terrible situations, however, there are some individuals in the world who experience anxiety on a very serious level. I have had my own anxieties, with panic attacks a couple times a week, or even just avoiding situations because I couldn’t stand things like crowds or strangers. And when I was diagnosed with PTSD, I became very serious on learning and understanding anxiety. Anxiety disorders, unfortunately, have also been given the same treatment as any other mental disorder: it is considered to be controlled, and could be turned on and off with a moment’s notice or a happy little thought. My opinion on mental illness is the same as probably any reasonable psychologist or student of psychology–it is the same monster as an individual with diabetes or pneumonia. It should be treated, maybe not necessarily with medicine, but it should be treated to improve the quality of life of the individual. This book is probably the best book that I have read this year about the treatment of anxiety. Unlike the adult help books I’ve read, this treats anxiety with the compassion and recognition it needs. 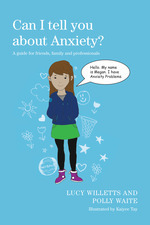 In this book, you meet a young girl named Megan who has anxiety. She describes in great detail how her anxiety has affected her (her separation anxiety, her General Anxiety Disorder, and other things like social anxiety and Agoraphobia), we read about relate-able experiences that can be understood by the youngest of audiences. What is excellent about this book is the thorough yet easily understandable explanation of Cognitive Behavioral Therapy. This has been proven a very successful treatment plan for anxiety, and the authors were kind enough to provide descriptions and examples of action plans and strategies to reduce you or your child’s anxiety. You are also given a very detailed guide on how a parent should approach the topic of a child’s anxiety, and how a teacher should assist a student of theirs who has anxiety. The authors do not use CBT as the know-all-end-all for treating anxiety, they also encourage constant monitoring of the child’s behavior by a licensed psychologist and they do bring up the idea of medication, although it is encouraged not to use medication unless the CBT does not work. I think this book was written in the UK, as it has a lot of different terms than if it was written in the US (lift instead of elevator, cross instead of angry), but the idea is universal. There are a list of resources and references to medical facilities and Psychiatric Offices for future reference, but if you are a non-UK reader, they will not be of use to you. Can I Tell You About Anxiety? is by far one of the best books I have read that cover anxiety at a level that anyone can understand while not undermining or patronizing individuals who suffer from it. It provides a lot of excellent tips that someone of any age can implement. I would find this book especially important for teachers, and some nice reading material to give to the parents who have children who experience too much anxiety. This is a great, great book. I did some research that the authors have other books that cover other topics such as eating disorders OCD, autism, et cetera. If you’re looking for a good understanding of mental illness, I would see what these authors have to say! This entry was posted in Uncategorized and tagged anxiety, Anxiety Disorder, Anxiety disorders, book, book review, children's literature, compassion, educational, great for parents, illness, mental, mental illness, OCD, psychiatry, psychology, PTSD, science, separation anxiety, social anxiety, teacher aid, therapy.